Audra Jennings: I just don't have time! I'm crazy busy at work right now - you can get a hint of that from my posts over the past few days. Like insane busy. Like at the moment my email is higher than it has been in a while. And I have lots and lots of follow-up that needs to be done. There's just not enough hours in the day, I tell you! Then, on the other hand, I really could use a day off work to finish getting my packing done and the rest of what I need to pack sorted. Then, once I get moved, I'll want to put everything up. But I really want to paint a couple of rooms before I get stuff in place. And then, I try to be a good aunt and have spent the past two Saturdays, and will spend the majority of the day tomorrow at basketball games. The result is a tired, grumpy, grouchy, cranky Audra. And now I'm hungry. And this brings me to my quandary of the moment... I don't have much here to eat, and I really don't want food here right now since I'll be moving my fridge next weekend and then living in limbo a few days before I will be staying at new place. I do have something I could cook tonight, but it would be "eat on this for several days" and I have been "eating on this for several days" for the past couple of weeks and I'm tired of the whole leftovers thing. I'm not in the "eat at a restaurant by myself" mood, especially on a Friday night when most of the restaurants are full. So, I'm trying to decide if it's Taco Shop time, and can you get down 7th today? You couldn't have gone by there last night due to road paving. When I went out for my Valentine's okra last night, they were detouring traffic. Our main road (a highway) where most of the restaurants are is being redone and it's a mess to get into many places right now. I could have eaten at my parents, but I was trying to finish something, and my mom had to eat immediately since she didn't eat lunch for getting her hair cut. My dad was annoyed by this too because he me yesterday we would move some stuff after work today, then go out to eat. At that point, I just wanted the press kit that I was working on to be finished. See, I shouldn't blog when I'm hungry and tired and cranky because my blogging becomes pointless. 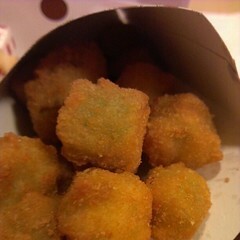 Just like this picture of fried okra.